Banana Bread! from Lara Schneider on Vimeo. I ran across this recipe online when I wanted to use up a bunch of bananas before they went too bad. The recipe turned out really well, and was the easiest I have ever found. I might have added a dash of nutmeg or all spice, and I'm sure if you added about a half a cup of chopped nuts it would work as well. My oven has been running about 100 degrees off it's real temperature, so last year I bought an oven thermometer so I could make sure I wasn't going to burn the heck out of my cakes! It really came in handy this time as this bread bakes for an hour, so if the oven were too hot I would have a burnt outside with a soggy mess inside. 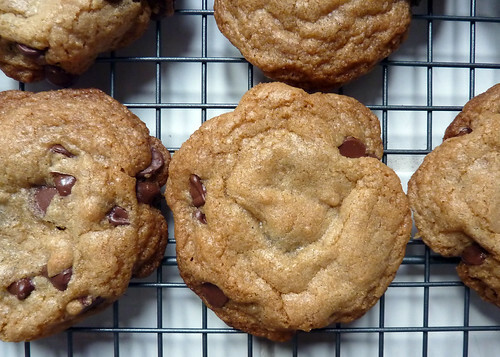 Yes I know I know, you would think I have posted enough chocolate chip cookie recipes, but can you REALLY have too many?? This one is modified from the back of the Ghirardelli Chocolate Chip package. It produced one of the chewiest cookies I have made so far. And of course the best time to eat it was about 5 minutes after it came out of the oven. Well I tested it right out of the oven, then at 5 minutes, and then at 15 minutes. And then later that night. Um...they were so good. The next day they were a bit crispier but delightful with a cup of coffee or tea to dip into. MMM! It yielded about 3 dozen cookies (package said 4), but I'm sure there could have been more if I didn't keep eating the dough. I don't recommend it with raw eggs inside, but hey I'm a glutton for stomach punishment when it comes to sweets.That's what TUMS is for, right?! Pour the dry ingredients into the bowl of wet ingredients, stir with wooden spoon or spatula until ingredients are incorporated and there's no more flour showing. Drop by tablespoon (I literally used my measuring tablespoon) onto un-greased non-stick cookie sheets. Bake for 8 minutes and cool them on a rack if you have one. They will seem under-done, but give them 5-10 minutes and they will be perfect! I probably can't say anything that hasn't been said already about Banana Leaf Malaysian Cuisine in Vancouver, but it really is one of the best places to eat down on Denman. If you like your food with punches of spicy, sweet and salty tastes, this is the place for you! There is nothing bland about this restaurant and everything I tried seemed so authentic. Malaysian food isn't super popular where I live in Seattle, so this was quite a treat when visiting my mom for Mother's Day. 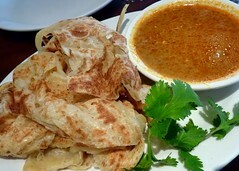 We shared a delectable appetizer called Roti Canai, that wasn't like an Indian roti that I've had before, but more soft with a touch of sweetness. The spicy dipping sauce was perfect, too! 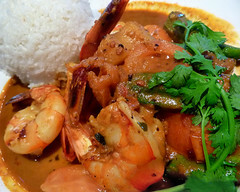 Then I had some spicy Tiger Prawns that were cooked with garlic and chili mixed with lemongrass and dried shrimp paste. SUPERB! And this was the first time I had okra that wasn't mushy, it was incredible. 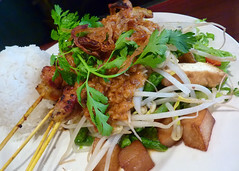 My mom's Satay Chicken was really good too. 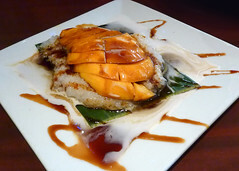 The dishes had just the right amount of food too, so we had room for dessert and splurged on the mango sticky rice. The texture was perfect, and whatever caramel-like sauce they made with it, was like crack...I just wanted more, and had to stop myself from using my fingers to wipe the plate clean! Check it out if you haven't already! Funny thing that prompted the making of some sweet cornbread the other night. I had looked over at my calendar and it said "May 6 - Jeff Haynie's Birthday", and I thought to myself, "Oh no! I forgot! I'll make some cornbread and bring it into work tomorrow morning!" I work with Jeff, and he's from the south so he loves a good cornbread. So I quickly went online and found a really easy one on All Recipes, and whipped it up in under an hour! Then it suddenly occurred to me that wait a minute...didn't we JUST celebreate Mr. Haynie's birthday a few months ago? OH MY GARSH, WE DID! And we even had pie, I mean, how could I forget?? So, my co-workers got to reap the benefits of my freak-out, and I brought it into work the next day along with some honey to drizzle on top after it was heated. SO GOOD. It's a pretty light recipe, and you only have to use one bowl! If I had a cast iron skillet I would find a recipe for that method, but I didn't so this was just fine. Right out of the oven it was pretty heavenly. 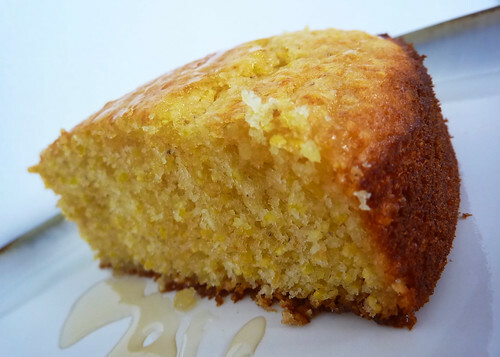 Top with butter or honey or both! Preheat oven to 400 degrees F (200 degrees C). Spray or lightly grease a 9 inch round cake pan. In a large bowl, combine flour, cornmeal, sugar, salt and baking powder. Stir in egg, milk and vegetable oil until well combined. Pour batter into prepared pan. Bake in preheated oven for 20 to 25 minutes, or until a toothpick inserted into the center of the loaf comes out clean. Wait a few minutes before cutting, but it really is the best when it's still warm. Enjoy! Original and Chocolate Crumb Cake! These were in 8 huge squares, so I cut them into little pieces to share with co-workers. They were from my Dessert of the Month club, that my father-in-law got me last holiday. A new dessert comes every few months! You can pick and choose how often they deliver, and for how long. There's also Beer, Cheese, Wine, Chocolate, and many more types of gifts to send monthly! 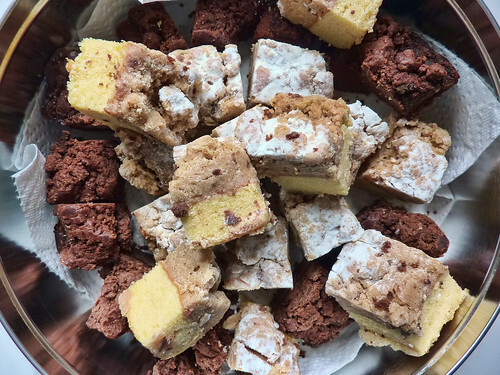 I have to say, this was one of the best crumb cake recipes I've ever tasted. Of course, with all the butter and eggs in it, I don't see how it could be bad. The chocolate was apparently cooked with a liqueur and hints of cinnamon. Delicious! It was my favorite, and although it seemed like it would be heavy, it had a nice lighter texture and taste. There's no way to know what dessert you will receive each month, but that's the fun of it! I really recommend Amazing Clubs for your next special gift purchase. And no, I'm not a spokesperson, but I suppose I should be now that I have done two posts about this company, haha!